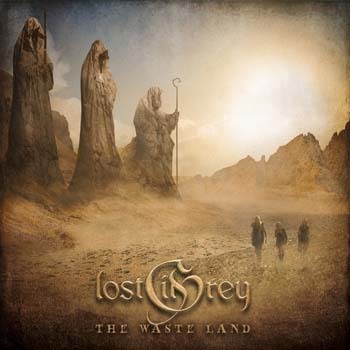 Δελτίο τύπου: «The Finnish theatrical metal band LOST IN GREY was founded in 2013. Inspired by symphonic and folk metal, literature and the world itself, Lost in Grey creates multifaceted music and brings elements of drama to the songs as well as live performances. The band will be releasing their 2nd album THE WASTE LAND in January 2019 via Reaper Entertainment Europe. On this new album Lost in Grey dives into the themes that lead to the story of their debut album THE GREY REALMS (2017). The Waste Land represents a place where suppressed thoughts and emotions are hidden. There they wither or live on as echoes and whispers. Telling the story, Harri Koskela (also keyboard), Emily Leone (also violin) and lyricist Anne Lill Rajala play the characters within the story and bring a very own touch to it through their diverse voice talents.